This has been a weird year for the Buffy and Angel fans. Moore Action Collectibles held the license for the 6" scale action figures, but ran into difficulties. The license went to Diamond Select, but not before some sculpts were already completed by MAC. It also looks like some of the old sculpts/molds went to Diamond in the deal, as we see with this new statue, Welcome Faith. 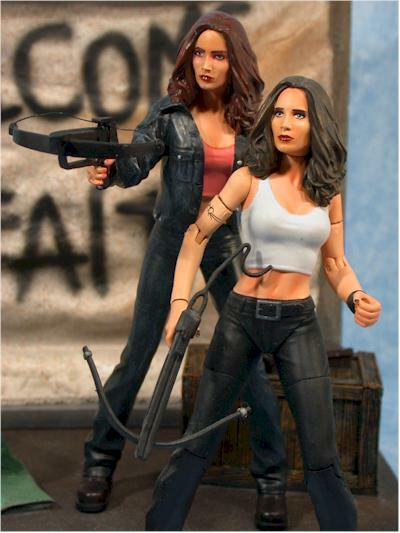 This statue/diorama is actually based on an episode of Angel, not Buffy. The episode was from the fourth season of Angel, and was titled 'Salvage'. This was the second period in which Angel became Angelus, this time on purpose in an attempt to get information on a beast named, appropriately, The Beast. Of course, things go wrong, and Angelus ends up running rampant. Wesley brings Faith into the picture to help bring both the Beast and Angelus in. 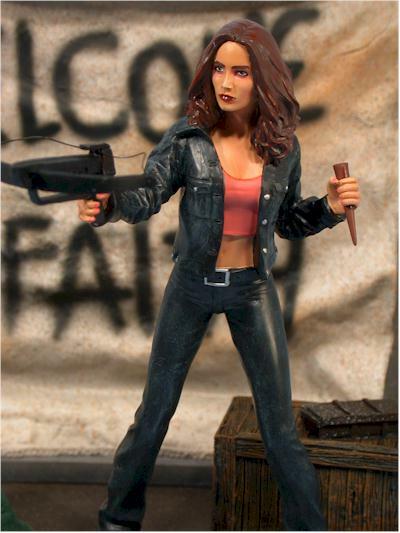 While the design is based on a specific moment in the show, the sharp eyed collector of Faith figures should recognize Faith herself from the previous Moore action figure. The set is in stores and comic shops now, selling for around $50. I have a few suggestions at the end of the review for on-line buying options. The box is fairly basic, but keeps the statue very safe, important since the entire thing is all one piece. Past DST/MAC statues have had pieces or figures that attached after you opened it up, but this time it's all a solid, single statue. There's also the usual very well done and colorful Certificate of Authenticity. Faith is a mighty tough girl to capture, both on the show and in resin. Just look at the issues Sideshow recently had with their 12" version. This statue was designed and sculpted by the folks from MAC, and they did a tremendous job, especially in this scale. The diorama and base are very nice, with the Welcome Faith banner that had been put up by Angelus, and a few warehouse like props around. Faith is very similar to the Faith action figure produced by MAC. It's not identical, since it includes the jacket, and without the joints, has a little better flow to the legs and arms. It's an excellent version though, and is easily the nicest Faith sculpt we've gotten to date. It's worth nothing that the string on the crossbow is actually a string - another nice touch to add to the realism. The quality of the paint application is top notch, right up there with the best busts and sculptures out there. A few things could have been improved in terms of design - the eye shadow is a bit over the top, and various finishes could have been used for the clothes and skin to give them a little more realism - but overall this is a very impressive paint job. In general, I really like the design. The base is larger than I had expected, much larger than the other DST Buffy/Angel statues we've seen so far. And the use of the same scale as the MAC action figures means they look terrific together. Of course, that also means that they cheated a tad on the sculpt of the actual characters, using the same designs and sculpts as the action figures themselves. That's a fairly minor complaint though, well outweighed by the overall quality of the diorama. At $50, the statue is a tad expensive, considering the scale. It's not a terrible value though, and you won't feel ripped. If you can get this down around $40, you can add another half star easily. I wasn't particularly excited by either the Spike or Dark Willow statues, mostly because of the small size and high price. This diorama is a much better value, and a much better design however. Faith fans should be particularly happy, considering the excellent sculpt and style. 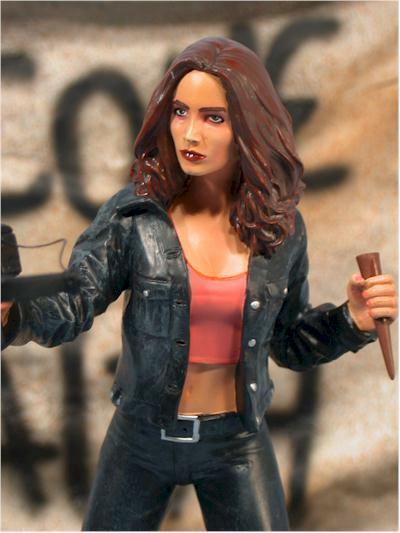 - Killer Toys has an excellent price at $40 for the statue. 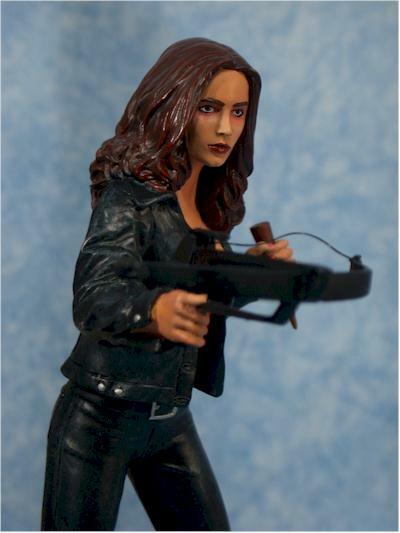 - Alter Ego Comics has her for $42.50. - Time and Space Toys has it available for $45, and has a TON of other Buffy and Angel merchandise, including several upcoming exclusives. - CornerStoreComics also has her listed at $45. KEEP SCROLLING DOWN FOR A COMPARISON SHOT WITH THE FAITH ACTION FIGURE!